Beware, this is going to have a lot of stupid. LOTS of stupid. Now, as I mentioned yesterday, I'm going to take a whack at #GamerGate's easiest target, Anita Sarkeesian -- the smirking brunette you see in the video below. Why "easiest"? Because this pseudo-academic makes so many statements that proves she doesn't play video games, it would embarrass anyone who had even an inkling of shame. Luckily, Sarkeesian doesn't have any, which is why she's part of the anti-GamerGate crowd. And, yes, I know that, when you look at the attached video, there's a statement of Anita's at the one-minute mark that has her stating out loud that she is "not a fan of video games," while at the same time portraying herself as an "honest critic who is also a fan." Seriously, Anita, turn it off, no one is buying it anymore. The internet is forever. As I said, this is going to be a writing blog. Will it also take a few swipes at the anti-GG crowd? Mostly insofar as I'm pointing out standard, basic writing devices that have been used all over the place, and yet have been presented here as something only done to women. And some of these claims? Some of these are not only stupid, but slanderous. You do not *have* to watch the following video, but if you do, be warned, there will be CGI blood and violence. So, if you've watched the video, you might have figured out part of my problem -- not just video games, but in terms of story in general. Either way, let's have a conversation. One of the things Sarkeesian uses in this video is the term "women in refrigerators," coined by Gail Simone after the Green Lantern Kyle Raynor found his girlfriend stuffed in a refrigerator by the primary badguy. The concept is "murder girlfriend, motivate hero." While I am not disagreeing with Gail Simone -- one reviewer I know described dating Raynor as a lethal STD -- this is a general writing trope. It's a cheap writing trope, given that it was a primary staple of 80s action movie. Stop me if you've heard this one: The Hero's long-term best friend and partner (who has wife and /or kids at home, and is only X-days away from retirement) is horribly and brutally murdered, leading our hero to go on a killing spree. Hell, that's the plot of the bond movie License to Kill, with Timothy Dalton -- his CIA friend Felix had been FED TO A SHARK. And Robin Hood, Prince of Thieves. And Rambo III. And the opening of The Searchers (a western with John Wayne and Jeffery Hunter). Hell, Uncle Owen and Aunt Beru were blown up. And oh, wait, how much of Back to the Future was driven (no pun intended) by shooting Doc Brown in the first half of the movie? Heck, the end of a bizarre cop movie with Charlie Sheen and Clint Eastwood (The Rookie) had all of act three go like this. But no, only women suffer from this syndrome. Uh huh. Right. And of course, women are never motivated for revenge in movies, right? .... Oh, wait. Red Sonja. Hannie Caulder. The Quick and the Dead. Hell, on Buffy the Vampire Slayer, did Willow's girlfriend Tara serve any purpose outside of being a victim of something in order for Willow to have character development? Hell, see the end to Buffy season 6. The second half of Season 5. Part of the gang-fight at the end of season 4. I can't say season 3, because Tara wasn't on the show then. Hell, weren't there a whole bunch of people whining about Agent Carter being defined almost solely by Captain America's death? How about we look at the history of Wonder Woman -- mostly how Steve Trevor was the damsel in distress. And wasn't the entire first act of Return of the Jedi rescuing a damsel named Han Solo? Madam Sarkeesian ... have you ever seen a movie? Read a book? These things pop up all over the place. Even in Star Wars. Have you even seen Star Wars? And the euthanized damsel ... wasn't that The Fly? With Jeff Goldblum? This was even the end of Terminator II: Judgement Day, where Ahhh-nuld had to die in order to save the future. Seriously, madam Sarkeesian, wake up and smell the 80s. Seriously, were you asleep in that decade? Or were you not born yet? If the latter, please go and take a look. And let me think. Have I ever seen a scenario where a loved one or best friend was forced to fight someone turned bad? Aside from every zombie film? Vampire film? Alien film? A quarter of the episodes of Buffy (season 2 finale, Xander at least once a season, Giles twice, Willow twice, Anya at least once, Angel for half a season)? Hi: did anyone see any Avenger film? Hawkeye vs. everyone? Age of Ultron perhaps? Hulk vs. Stark? Hell, is there a single hero in any comic book universe who has NOT been turned into a tool for the bad guys at least once? They've made entire storylines out of that -- Civil War for Marvel, Injustice for DC,Hush for DC. Nerds call it Kirk vs. Spock (for Star Trek three times). Thirty Dates of Night ends with (SPOILER) the husband murdering himself in sunlight, sacrificing his humanity and his life to save the town and the wife he loved so much. These are standard writing tropes. Basic, dirt-stupid writing devices. Good God, isn't one of the basic premises of Twilight that the vampire boyfriend will rip her girlfriend's throat out if he isn't careful? I don't think you get much more stupid than that. Heck, the Honor At Stake series even has a few of these going through, and effects both male and female characters. Threats to Marco motivate Amanda from the end of book 2 into most of book 3. Killing associates and destroying property of Marco sends him flying off the handle. We won't even go into Marco as being a threat to those around him. 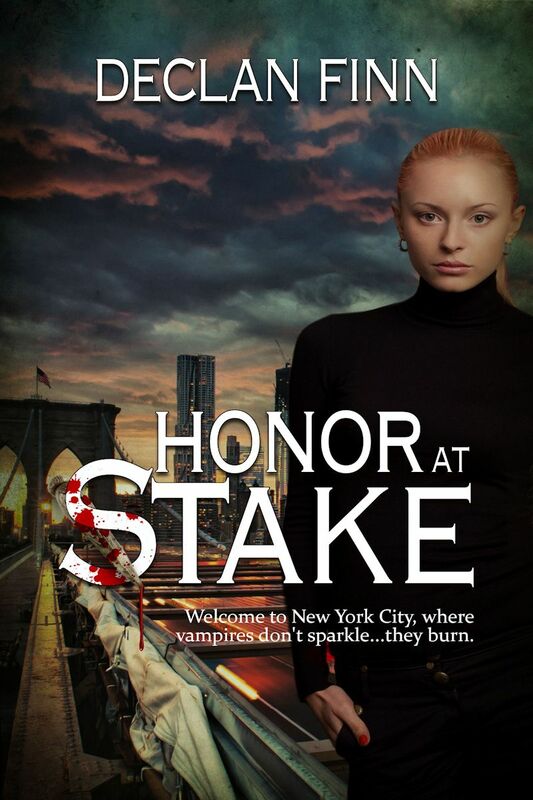 And no, even those people who have read Honor At Stake already don't know how that works yet. Heh heh heh. Yes, for those who want to know, there are other books in the series. I've got book 3 already running past some of my alpha readers, and book 2 is already under contract. At the end of the day, this list of tropes in films and television I've given? These are things I've come up with off the top of my head at one in the morning at the end of a long weekend. One of my family's laws is simply: Never attribute to malice what can be equally attributed to stupidity. Personally? I don't see how Sarkeesian could even feign ignorance about these tropes -- either in video games in particular or writing in general. "The Hero's long-term best friend and partner [...] is horribly and brutally murdered, leading our hero to go on a killing spree." Adding another comment because I forgot to click "notify". The threat to Marco's father as well. Another name for the trope is "child in jeopardy." Combined with "all your family dies"... which isn't even all about motivation but probably even more about isolating the protagonist and removing their support structures. When I had babies and when I first began to seriously consider writing novels and to work on this, I explored a story that might be called "vengeful mother". Of course it was on an alien planet that humans had colonized and it was a combination of (as I look back) a WW2 "underground" story slash the Punisher. And it certainly wasn't that I was, at any level at all, fantasizing about being "free" but recognizing just how free loosing everything would make a person and just how dedicated to mayhem you'd be with nothing left to protect. My protagonist wasn't a man, but a mother.